This is square Canadian National Express porcelain sign. 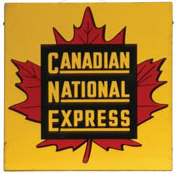 This particular Canadian National Express sign features a red maple leaf with a yellow background. It reads, “Canadian National Express”.